Today there are dozens of options for high-end laptops and mobile computing, and while extreme raw performance is nice to have, it is not necessary for the majority of users. 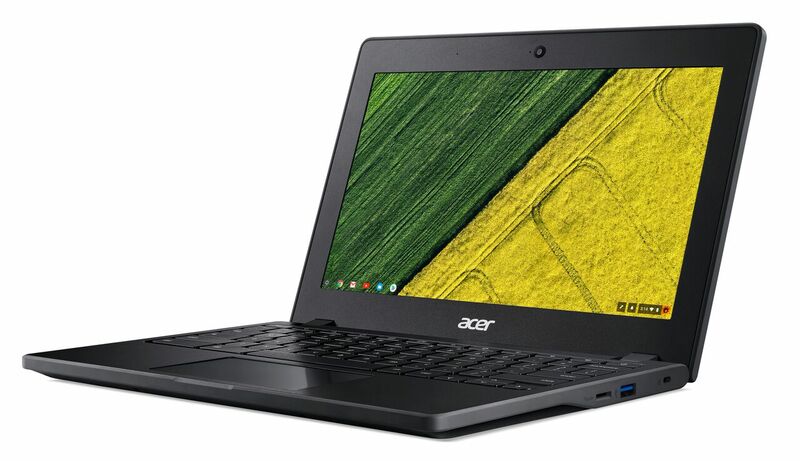 Focusing on productivity and durability, the Acer Chromebook 11 C771 meets the needs of educators and professionals to provide a solution that is meant to work under rough conditions. Passing MIL-STD 810G tests, the Chromebook 11 C771 can hold up to temperature variation, drops, spills, and dust ingress. Rubber bumpers on the corners of the casing have been added to allow survivable drops up to four feet. In addition, a honeycomb structure has been implemented in the lid so that placing up to 132lbs on top of the laptop will not crush it. This is more than enough to allow the Chromebook to be tossed around in a backpack or briefcase without worry. In terms of IO, options are limited compared to massive gaming laptops, but are more than sufficient for a highly portable machine. A USB Type-C port, HDMI port, USB 3.0 port, and 3.5mm TRRS combo jack can be found on the left hand side. On the right hand side, a microSD card reader and second USB 3.0 port can be found in addition to a Kensington lock port. Opening up the Chromebook 11 C771 reveals an 11.6 inch IPS panel with a resolution of 1366x768 that optionally comes as a touch screen (C771T). Although not pictured, the hinges allow a full 180 degrees of range so that touch screen users can enjoy a flat surface to work on. A fairly simple 720p webcam with built in microphone is centered above the screen. Keeping with the theme of durability, the keyboard leaves little space around the edges of the keys to help prevent liquids from quickly entering and from key caps being removed. Liquids are directed to drain out the bottom of the laptop in the event of a mishap. Inside the C771, a 6th Generation Intel Celeron 3855U comes standard, although Core i3 and Core i5 models will also be available. A 32GB eMMC module can be found for storage alongside 4GB of RAM. A 2x2 MIMO 802.11ac wireless adapter is also present. The specs are not likely to impress any enthusiasts, but they are very helpful in providing up to 12 hours of battery life on the touch screen model and up to 13 hours on the non-touch variant. Weighing in at only 2.98 lbs and measuring 0.82 inches thick, the Acer Chromebook C11 C771 is extremely portable given that it can last for an entire day of school or work. The standard C771 and C771T models will be available to commercial and education customers in August with suggested retail prices of $279.99 and $329.99 respectively. The Core i3 and Core i5 models will be available for purchase starting in September.